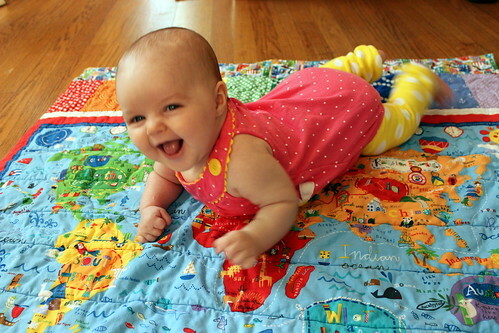 Before Esther was born, Lawson and I saw this fun map fabric at Drygoods Designs in Seattle and had to get it, since he loves maps. 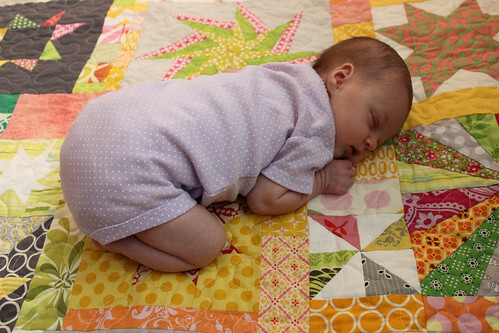 I figured that it would make a good playmat/floor quilt for Esther and I meant to make it before she was born... which didn't quite happen, but I was happy to get it made a few months after she arrived and still in plenty of time for her to play on it. She seems to like it, wouldn't you say? 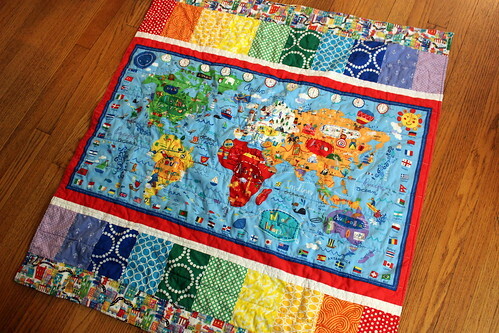 Since I was sewing this with a newborn in the house, I kept it really simple - rather than quilting and then binding it, I sewed it more like a blanket (but using two layers of batting to make it a comfier playmat), and then quilted it after topstitching the edge down. 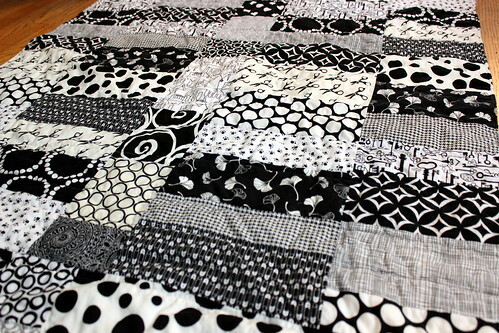 The quilting is some very minimal straight lines. You can see, she's already studying the fun map in the photo above. When we've had older kids over they've had lots of fun checking out the map and finding neat details on it, which makes me think this may be useful for a longer time than I expected! For the back, I pieced together a bunch of black and white prints, since babies are supposed to particularly like looking at these types of high contrast images. And I mixed in some fun i-spy type prints (keys, scissors, leaves, safety pins, dog prints), thinking they would be fun to point out and talk about when she gets older. So it really is a pretty reversible little playmat! 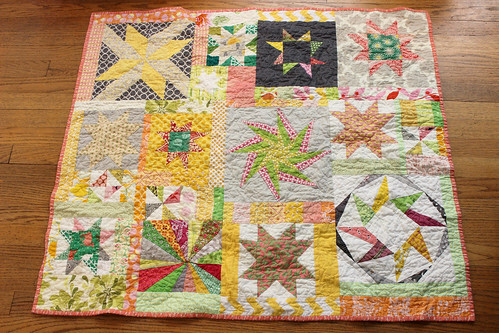 Esther now has quite the collection of quilts, between the one I just posted about from my do.good stitches bee mates, and the earlier one that I made for her, not to mention several others that we have received as gifts... but between always having one on the floor to play on, having one to take to the park or on the back deck, having one to snuggle under (and having some in the laundry after all those activities) they really all do get put to good use! 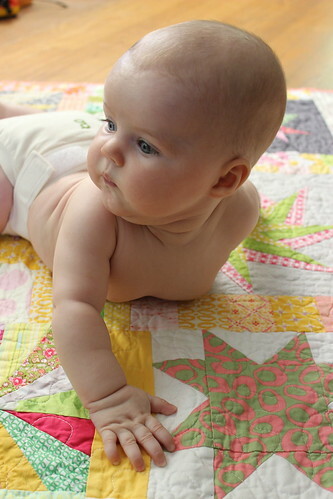 As I mentioned in my earlier post, Esther received a lovely gift of a baby quilt made by the members of my do.good stitches bee, the love circle. I so enjoyed the creativity that goes into the bee and the challenge of making different blocks each month, especially when the quilter for the month gave us some room to play around. So the lovely quilt that Natalie coordinated, pieced together and quilted for us is so special to me... not only because its so beautiful in its own right but because it means so much to me to get to have a quilt that really represents how special and creative this bee is. 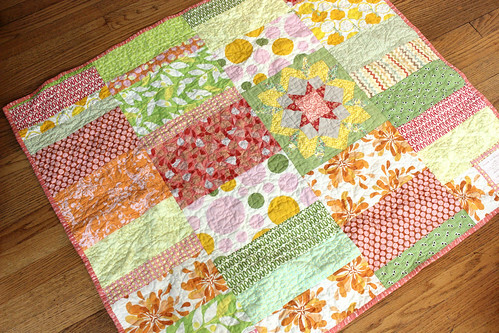 I love the scrappy back almost as much as the front - I have to use both sides so we don't miss out on this awesome star! 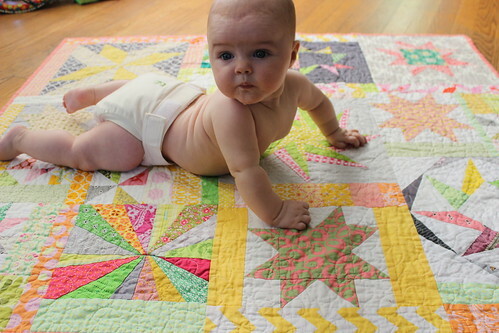 The quilt seemed so big when Esther was just a few weeks old but she is getting so huge it no longer seems big at all! 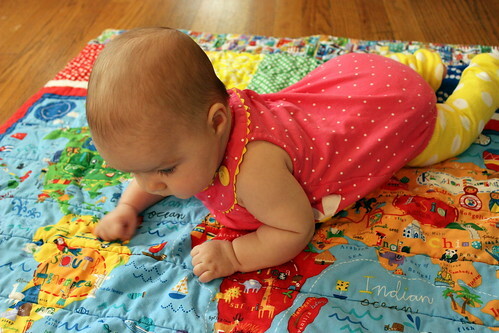 Its the perfect playmat (and great for the two of us to snuggle up under, too).